Surgeons halfway through their inturnship or specialists in urology. Two days’ training course where the participants rotate between laparoscopic and robotic stations operating on anathesiasized pigs. Also Simulator trainings with a varietry of computerized traning scenarios (da Vinci + Simbionix). There is a possibility of a 3rd day spent at the operating room in Department of Urology at Aalborg University Hospital – this is free of charge! 1-4 trainees: Robotic training only! 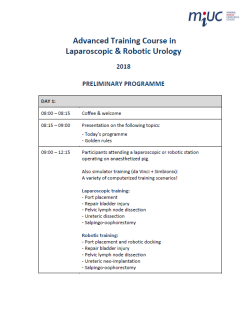 5-6 trainees: Laparoscopic & robotic training! Medical specialist in laparoscopic and robotic surgery. The course will be held in English unless all the participants are from Denmark. MIUC can be of assistance in regards to hotel reservation at the Hotel Gestus (formerly Chagall) which is within walking distance of the course location. The price for a single room including breakfast i DKK 585. Two weeks prior course start. NB! In regards to no show/late cancellation less than 1 month in advanced the fee is DKK 2,000!